Although 3D printed instruments have been around for a while, an engineering firm is now making them as solid as can be. While most people won’t have many issues with their instruments, travelling musicians and roadies know the value of a solid piece of equipment, especially during transport. However, even the most brutal of guitar players may have met their match in a new 3D printed instrument. Engineering firm Sandvik’s guitar is supposedly a smash-proof metallic masterpiece. Don’t take our word for it: veteran, neo-classical virtuoso Yngwie Malmsteen was brought on board to test it himself and he isn’t shy about his enthusiasm. Malmsteen and the various demo-testers have been putting the guitar through hell to show its solid form. So far, it seems unscathed from being bashed on various surfaces from floors to chairs to a live stage. It holds up nicely, even keeping together the various parts that aren’t part of the full solid frame. Sandvik’s engineering team made the guitar precisely to Malmsteen’s specifications. The company wanted to show that steel can be both light and indestructible within certain designs. As a result, the team got together their engineers along with guitar designers to put together Sandvik’s guitar from scratch. This is the company’s first axe, so it was probably a great help to have guitar designer Andy Holt on-board. 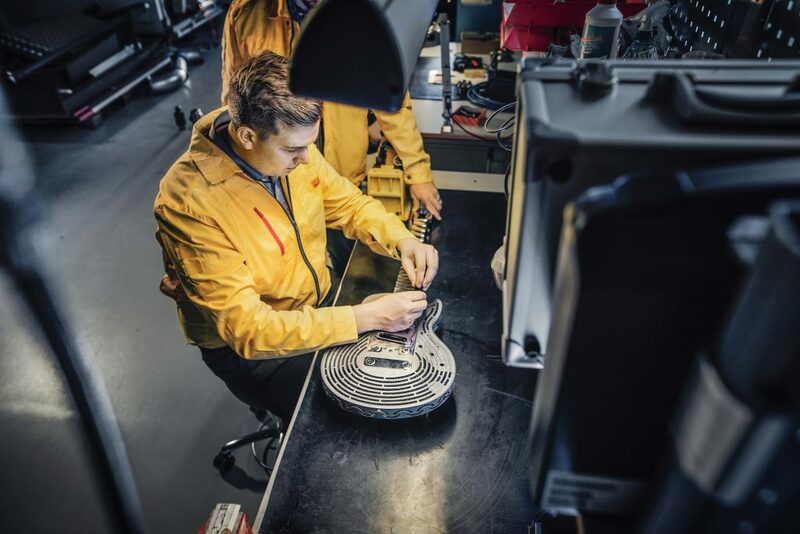 For the 3D printed body, Sandvik utilised their own expertise in metal powder and additive manufacturing. Using lasers, they traced a design out of titanium powder, fusing the layers of material one on top of the other. The neck, on the other hand, is a steel construct. According to Sandvik, the layer resolution is thinner than the average human hair. As a design, Sandvik’s guitar has no real joints. It conjoins together, from body to neck to headstock forming a solid, singular structure. On the other hand, the various add-ons like humbuckers, string-tuning knobs and peripheral parts are removable. The peripheral parts were put on afterwards but appear to be surprisingly solid as part of the whole guitar. A super-light lattice structure between the guitar’s neck and fretboard helps keep the whole thing together, strengthening both of them as they meet the body. 3D printing was crucial for the creation process as it allows for easy production of novel architectures. Featured image and video courtesy of Sandvik.